For what it’s worth, my life has been in a state of high flux. Not the type of flux one likes talking about. So…the first of June, I quit my job of eight years. The last nine months there were unpleasant for a variety of reasons. Near the bursting point, I threw my hands up and turned it over (as I have been taught to do, but still find very difficult). And then that wonderful thing Anne Lamott and Melody Beattie and others talk about happened. A door flew open; new opportunities presented themselves. I’d had a trip planned to Connecticut for my niece’s June 10. This was accomplished without the worries of having to return to a job that had worn me down. The wedding was simple, beautiful, joyous, and precious. It couldn’t have been nicer! Two other real treats awaited us, as well…a visit to a special family cemetery located in what was once a family belonging to the Brooks/Wyant families and is now part of the Bear Mountain State Park in New York above the Hudson River followed by a quick stop at George Washington’s headquarters along the Hudson during the last 18 months of the Revolutionary War. He hammered out the peace agreement in that residence. The other was to the Mark Twain House in Hartford. My friends, if you have a love of Mark Twain and/or American literature, this is something not to be missed. Ditto those who appreciate architecture and history. Words fail me. It was a completely satisfying afternoon filled with information and wonderful surprises. Now, I write this after my return from Spokane, Washington, where I took myself on a small road trip to visit Very Good Friends. They have moved to a different house since last I was here, so the setting was different. But the vibes are still as good as they always were. Another special time to be savored. A couple of new gigs await me, and I’m very excited to get on with things! Since the change, life has been more serene. I am spending time at the computer working on the new stand-alone novel. I don’t yet know how Sage gets to where she’s going, although I do know where she ends up. It is a journey of discovery, murder, and many pitfalls, some unknown as yet. I was talking with my friend Linda about the writing process. We agreed that we hate first drafts. We need to get somewhere, but it can be like crossing the continent on foot alongside a wagon. Rewrites are where it happens, and where it gets to be fabulous fun. It will be a while before the rewrite, but you will be the first to know. Summertime in Portland, theatres do not quit–even though their official seasons are over. 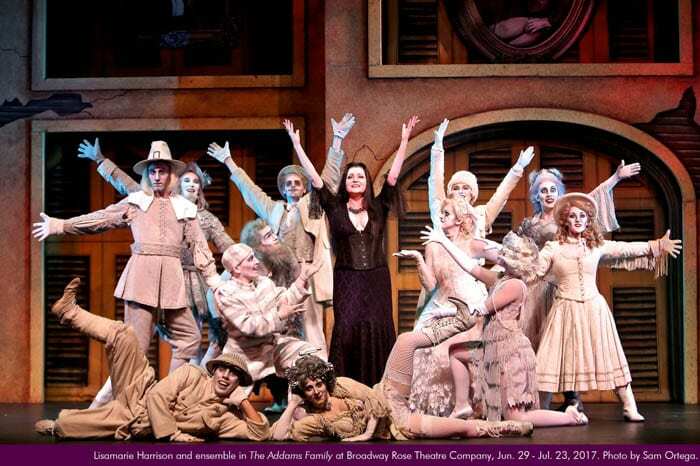 Clackamas Repertory Theatre’s summer season opened June 30, with Baskerville, while at Broadway Rose Theatre it was opening night for The Addams Family. And Lakewood Theatre opens its 65th season with Gore Vidal’s Visit to a Small Planet, a mid-century social satire, on July 7. New plays will have their days July 28-30, with JAW: A Playwright’s Festival featuring staged readings of scripts in development and a host of other performance activities, at Portland Center Stage at the Armory. All JAW activities are free and open to the public. The Mark Twain house in Hartford is a fantastic experience. And who knew that he lived next door to Harriet Beecher Stowe? I know! Totally cool, right? Her place was undergoing some renovation, so we skipped it this time. I would love to have been a neighbor! Serenity is good! Very Good Friends are good! Plays and new opportunities are good! Writing is good! Good for you!!!! So good to know that letting go works. I appreciate your courageous decision making and look forward to more here! Yes, it usually does work if one is brave enough to try it. Congratulations on moving forward in such a positive manner! Looking forward to reading your next gem.